The Nokia E63 is in essence the baby brother budget version of the very popular Nokia e71 but with the same core features. Nokia isn’t famous for phones that look good so I was surprised that the Ruby Red version of the Nokia E63 is quite stylish and although it doesn’t have all the features of new smartphones like the HTC Magic/iPhone 3Gs the e63 makes up for it by costing about $600 less! I’m not sure why I hadn’t heard of the Email On 3 service before because its pretty easy to use, gives you unlimited email access including attachments and is available at the bargain price of $5 per month without the need to buy a datapack (already included in the cost of X Series packs $8 and above). Email on 3 Supports upto 6 email accounts – Exchange/OWA (Outlook Web Access), Hotmail, Yahoo, Gmail and any personal or Internet Service Provider (ISP) email accounts such as iiNet, Bigpond, Internode which can be accessed via POP or IMAP. 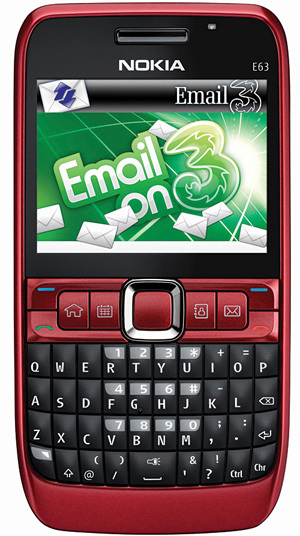 “Email on 3” is an application and service created by SEVEN and branded by 3 Mobile. It is sometimes effected by issues in the SEVEN servers outside of 3 Mobile’s control because messages go via the SEVEN server. All messages sent via this server (and only via this server) are included in the $5 unlimited usage cap. Why would I use Email On 3 when I can access my hotmail, gmail or yahoo via the web? Email On 3 provides you with instant email. There’s no need to log in every time to access you email, and you get instant notifications when you get a new email. Emails are stored on your phone. How do I make sure “email on 3” doesnt result in extra charges? If the phone asks for an access point, you must select “Planet 3” as the access point in order for it to be unlimited. 3 mobile uses the SEVEN email system to run “Email on 3”. Does the email data get compressed by that service to speed up download times? Yes, it does. The client strips the emails down to TEXT only, and truncates the size to a maximum of 50 Kilobytes. This ensures efficiency on most handsets, and faster email download. Images and attachment can be downloaded manually at no extra cost. The Seven client also encrypts emails to enforce security. How can i enable audio notification for new emails on the Nokia e63? Menu -> Tools -> Settings -> General -> Personalisation -> Home Screen -> Mode Settings -> Home screen applications -> E-mail 1 notification (or E-mail 2 notification if you already have another account set on this one) then select the mailbox that you have configured. You can then set the type of preview you’d like on the homescreen. I’m working EmailOn3 on my 6120c and the battery overhead is reasonable given the benefits of the application for my purposes. I have always needed to charge it every second day anyhow, and with the application installed, still adhering to that cycle. The Nokia e63 is available on 3 Mobile’s $19/$29/$49 and higher cap plans or for $399 outright from 3 Mobile or other online stores if you want to use it prepaid. Whether you call Nokia E63 the economy package – or stimulus package, in the jargon of the day – you’re looking at a capable business device. It brings the essential skills of the E71, and only sacrifices looks to round off that sweetly trimmed price tag. If you’re choosing between the E71 and E63 we don’t envy you. The differences in hardware (no HSDPA or GPS) are made up for in its cheaper price tag. The E63 will make an excellent messaging phone for people who need to be connected without the trimmings. In the end, the Nokia E63 is just a fantastic little device. It gives business users most all of the functionality they need, as well as enough of the entertainment capabilities they want. The new red and blue color schemes are both visually striking, and the overall build quality of the phone is top notch. Application-wise the Nokia E63 is packed. Most of the functions are, as one would expect, business focussed, and include a PDF Viewer, zip manager, and images with contacts. Internet connection is super fast and can be accessed by using 3G HSDPA, wifi, Bluetooth, GPRS or EDGE. Does anyone know if Nokia E 63 will be supported for Blackberry Connect anytime soon? I use to have the E71 and it was a very nice and practical phone with lots of features. The E63 look to have the same spec as the E71. This seems to be a great phone and will be very good for business customer who want a Nokia and want email on the move. I had this phone for the last 6 months and i have to say that i have no regrets, its been really easy to use and it look really attractive and I just love the wide screen of this mobile. It also has an very good clarity…..great phone. I like this phone . It has very high speed internet modem, and lots of stuff for internet users.